French: Arnica à feuilles éntroites. Published in In Hornem., Fl. Dan. 9(26): 5. t.1524. 1816. Type: Greenland: "Groenlandia", leg. Gieseke, selected by Downie (1986). Described in the protologue from western Greenland: "E colon. Omenak [Umanak] et Godhavn". Holotype: S.
Synonymy. Arnica alpina (L.) Olin var. angustifolia (Vahl) Fernald, Rhodora 36: 96. 1934. Arnica alpina (L.) Olin subsp. angustifolia (Vahl) Maguire, Madr?no 6: 153. 1942. Arnica plantaginea Pursh, Fl. Amer. Sept. 527. 1814. Arnica alpina (L.) Olin var. plantaginea (Pursh) Ediger and T.M. Barkley, N. Amer. Fl. Ser. II. PT. 10: 32.1978. Arnica attenuata Greene, Pittonia 4: 170. 1900. Arnica alpina (L.) Olin subsp. attenuata (Greene) Maguire, Madroňo 6: 153. 1942. Arnica alpina (L.) Olin var. attenuata (Greene) Ediger and T.M. Barkley, N. Amer. Fl. 10: 31. 1978. Arnica sornborgeri Fernald, Rhodora 7: 147. 1905. Arnica alpina (L.) Olin subsp. sornborgeri (Fernald) Maguire, Brittonia 4: 414. 1943. Arnica terrae-novae Fernald, Rhodora 27: 1925. Arnica alpina (L.) Olin var. inundata Porsild, Meddel. Groenl. 58: 181. 1926. Arnica alpina (L.) Olin var. vahliana B. Boivin, Nat. Can. 75: 209. 1948. Arnica alpina (L.) Olin var. vestita Hultén, Lunds. Univ. 2. Sect. 2, 46: 1588. 1950. Arnica alpina (L.) Olin var. ungavensis B. Boivin, Phytologia 23: 94. 1972. See further synonymy in Downie and Denford (1988b). Vegetative morphology. Plants (5–)10–30 cm high; perennial herbs; never vegetatively proliferating by bulbils on stems or leaves, in inflorescences, from gemmiphores and gemmae, or by fragmentation. Taproot present. 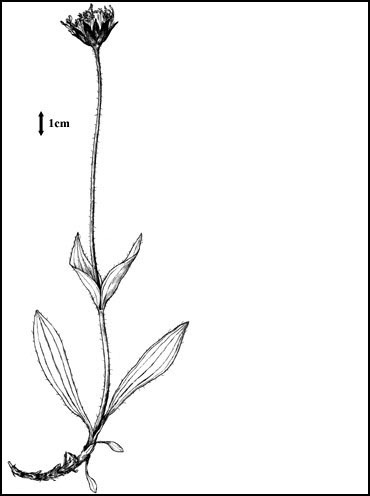 Ground level or underground stems horizontal, or vertical (usually); rhizomatous; elongate, or compact; 1.5–5 mm wide. Caudex present (short and stout). Aerial stems developed; erect. Aerial stem trichomes spreading. Leaves heterophyllous (with and without a petiole), or not heterophyllous (similar in shape); mainly basal and distributed along the stems; erect; opposite; dying annually and non-persistent. Petioles present (basal leaves), or absent (stem leaves); 0–45 mm long; winged, or not winged; with sessile glands, or without sessile glands; glabrous, or hairy; short golden brown, gland-tipped hairs and occasionally much longer white hairs. Leaf blade bases obtuse (sometimes red pigmented). Blades 30–110 mm long, 7–22 mm wide, spreading, lanceolate or oblanceolate, flat, with three main veins. Blade adaxial surface with sessile glands, glabrous or hairy, hairs pilose (with long multicellular, bulbous based hairs, non-glandular hairs, and short tipped hairs in approximately equal proportions), hairs glandular and simple, hairs sparse or moderately dense, hairs white, or translucent (non-glandular hairs) or tawny (gland tips on short hairs). Blade abaxial surface with sessile glands, hairy, hairs pilose (with long multicellular, bulbous based hairs, non-glandular hairs, and short tipped hairs in approximately equal proportions), hairs sparse or moderately dense or very dense, hairs a mixture of white and yellow, hairs wavy (the long hairs), hairs spreading. Blade margins entire (usually) or serrate (rarely, the margin may have one or two teeth), with non-glandular hairs; apices acute. Reproductive morphology. Flowering stems solitary; with leaves. Flowering stems hairy. Flowering stems woolly. Flowering stem hairs simple (and floccose); shorter than the diameter of the flowering stem; glandular hairs present. Leaf or reduced bract subtending the base of the inflorescence without calloused tip. Inflorescences solitary heads. Flowering heads 15–30 mm deep; (25–)35–45 mm wide; with disc and ray florets. Involucral bracts present. Number of rows 1–2 (very similar). Outer involucral bracts mostly green, or mostly wine red or purple pigmented; lying adjacent to the flowers; lanceolate; 10–15 mm high; 2.5–3 mm wide; sparsely hairy (at the apex), or densely hairy (at the base); with glandular hairs, or without glandular hairs. Inner involucral bracts lanceolate; 8–13 mm high; 2.5–3 mm wide; margins narrow and scarious, less than one quarter of the bract; apex entire. Flowers bilaterally symmetrical (zygomorphic) (ray florets), or radially symmetrical (actinomorphic) (disc florets); unisexual (ray florets), or bisexual (disc florets). Sepals represented by a pappus. Pappus with a double row of hairs; whitish. Ray florets pappus 5–7 mm long (long filaments), or 0.3–0.5 mm long (short filaments). Disc florets pappus 5–8 mm long. Petals conventional; fused (with hairs at the base of the tube); 5; yellow; 6.5–7.5 mm long. Corolla flat, strap-like (ray florets), or funnel-form (disc florets); 3-lobed (ray floret limbs), or 5-lobed (disc florets). Ray florets 10–18; limb 7–19 mm long; limb 4–8 mm wide. Stamens 5. Anthers yellow; 2–2.5 mm long. Ovary inferior; carpels 2; syncarpous. Styles 1; 5.5–6.5 mm long. Stigmas per ovary 2. Placentation basal. Ovules per ovary 1. Fruit sessile; with calyx persisting; dry; cypselas; oblong (trapezoid); brown (pale); 3–5 mm long; 0.9–1.1 mm wide; hairy; surface venation ribbed; distinctly flattened; indehiscent. Seeds 1. Chromosome information. 2n = 38, or 57, or 76, or 95. 2n (5x) = 95. Downie (1988, Canada). Ploidy levels recorded 2x, 3x, 4x, and 5x. Phenology. Phenology: Flowering: July, August, early September. Southern exposures. Indigenous knowledge. Burt (2000) reported that this species is not used by Inuit people living near Bathurst Inlet. 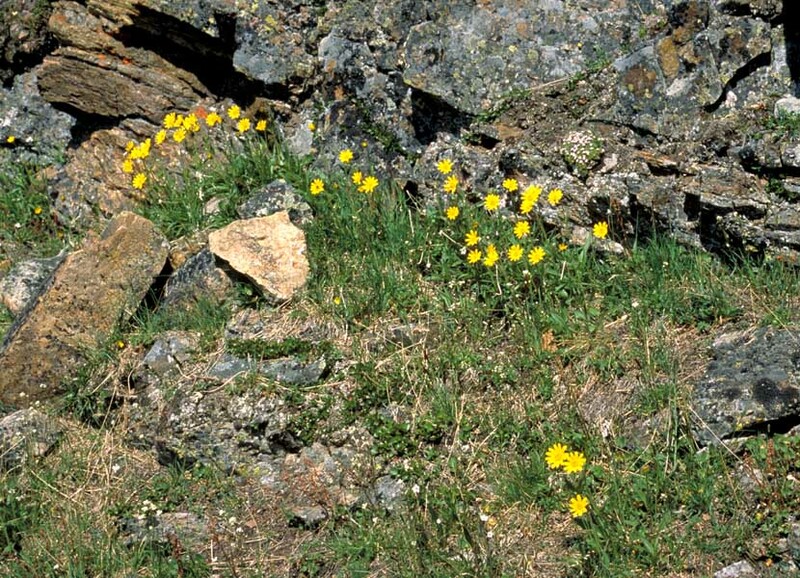 Andre and Fehr (2000) noted that the Gwich'in people call this plant dandelion and use the flowers to make tea. The Elders say that it is good for some stomach ailments. Ecology and habitat. Substrates: tundra, slopes, ridges, cliffs, seashores; imperfectly drained moist areas (rarely), dry (often in bird-manured sites), moderately well-drained areas; gravel, sand, clay. North American distribution. Alaska, Yukon, Northwest Territories Islands, continental Northwest Territories, Nunavut Islands, continental Nunavut, northern Quebec, Labrador. Range in the Canadian Arctic Archipelago widespread. Common. Arctic (occurs as far south as Alberta-Montana border). Arctic islands: Baffin, Ellesmere, Axel Heiberg, Parry islands (Emerald Island), Banks, Victoria, Somerset (Digges Island and Boothia Peninsula). Northern hemisphere distribution. Circumpolar, or circumboreal (arctic-alpine). Northern Fennoscandian, KaninPechora, Svalbard  Franz Joseph Land, Polar Ural  Novaya Zemlya, YamalGydan, Taimyr  Severnaya Zemlya, AnabarOlenyok, Kharaulakh, YanaKolyma, West Chukotka, Wrangel Island, South Chukotka, East Chukotka, North Alaska  Yukon, Central Canada, Labrador  Hudson Bay, Ellesmere Land  Peary Land, West Greenland, East Greenland. General notes. There is some lack of balance in current treatments between North America and Eurasia. American material is now often divided into subspecies or varieties or entities are not recognised at all. Eurasian material is either treated as one entity (in spite of heterogeneity) or divided on species. Korobkov and Elven, in Elven et al. (2003) provisionally proposed treatment as 5–6 major races (subspecies), stating that there is probably agamospermy, but at the same time each of the races are morphologically and geographically characterised. 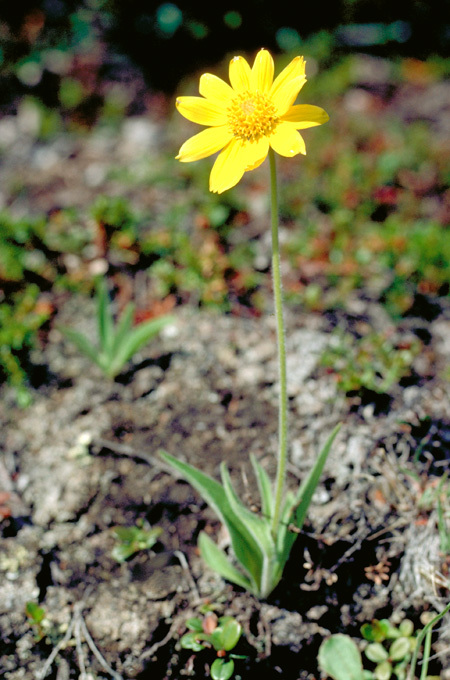 Downie and Denford (1988b), in an evaluation of systematic relationships in Arnica subgenus Arctica, found that the complex consists of seven species. They proposed no new taxa and recognised several previously proposed taxa as synonyms. They found that A. angustifolia, A. frigida, and A. lonchophylla, each consisting of two subspecies, are extremely polymorphic and variable in chromosome number. Downie and Denford (1988b) provided a taxonomic revision of the subgenus including descriptions, keys, synonymies, distribution maps, and a discussion of phylogenetic relationships. 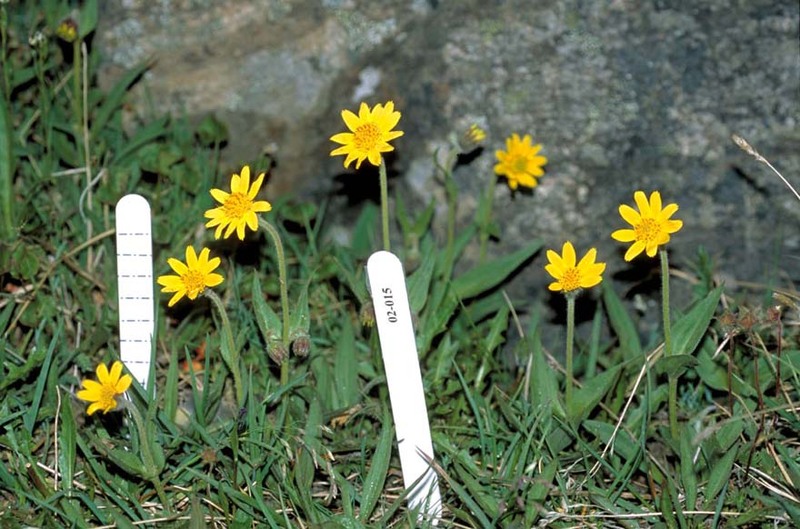 Downie (1988) reported that the Arnica angustifolia aggregate is a circumpolar taxon made up of a number of geographically distinct infraspecific taxa. Cluster and principal component analyses of 99 populations revealed the aggregate to be best represented by two subspecies: A. angustifolia subsp. angustifolia (a combination of the previously recognised subspecies angustifolia, attenuata, sornborgeri, intermedia, iljinii, alpina, and plantaginea) and A. angustifolia subsp. tomentosa. 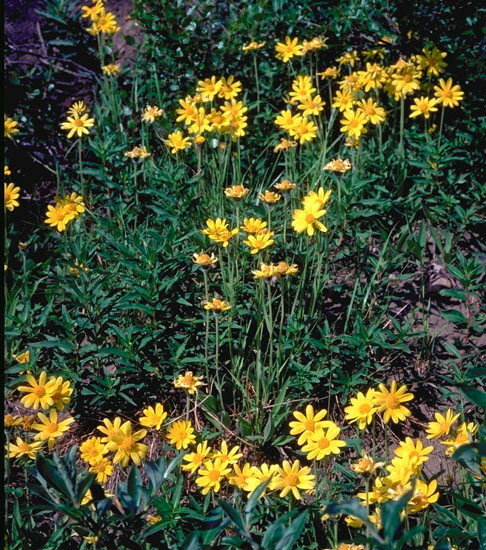 Downie (1988) stated that Arnica angustifolia subsp. angustifolia is polymorphic and varied in ploidy level and foliar flavonoid chemistry. He found no significant differences among the means of 14 characters in plants collected from six broadly delimited geographic areas. He discerned four cytotypes (2n = 38, 57, 76, and 95) and seven flavonoid glycosides (five flavonols and two flavones). Downie and Denford (1988a) isolated 12 flavonoids (including seven flavonol and three flavone glycosides, one flavone aglycone, and one unknown) from the leaves of 198 populations of the seven species comprising Arnica subgenus Arctica. They found the flavonoid profiles are relatively simple, with two to six compounds found per population, but considerable flavonoid variation was apparent in populations of A. angustifolia, A. frigida, and A. lonchophylla. These authors suggested that in subgenus Arctica, flavonoid diversity appears to have accompanied high morphological variability and suggested that leaf flavonoid chemistry supports the hypotheses that the absence of any highly derived or methylated flavonoid suggests the subgenus Arctica probably represents the most ancestral subgenus in Arnica. Small and Catling (1999, p. 29) indicated that "Arnica should not be taken internally, as it is sufficiently toxic that it may cause fatal poisoning. Unidentified substances that it contains can produce stress on the nervous system, the digestive system, and the circulatory system, resulting in muscular weakness, collapse, and even death. Experiments with small animals have confirmed that arnica causes cardiac toxicity and large increases in blood pressure. This herb was listed in a 1995 Health Canada document as unacceptable as a non-prescription drug product for oral use (see 'Herbs used as non-medicinal ingredients in non-prescription drugs for human use,' http://www.hc-sc.gc.ca/hpb-dgps/therapeut/drhtmeng/policy.html)... Although not safe for human consumption, Arnica cordifolia has been identified as an important constituent of the diet of elk and mule deer... Applied to the bald scalp, arnica is said to make hair grow, although skin irritation is the more likely result." Illustrations. • Habitat. Plants growing on sandy beach, near coast guard base. N.W.T., Tuktoyaktuk. 21 July, 1981. J.M. Gillett 18743. CAN. • Habitat. Plants growing in the shelter of a rocky cliff. Nunavut, Baffin Island, Iqaluit. Aiken and Mallory 02–015. CAN. • Close-up of plants. Plants 10–15 cm high, with opposite leaves, and single flowering heads of yellow ray and disc florets. Aiken and Mallory 02–015. CAN. • Plant habit. Plant with mainly basal, opposite leaves and a flowering head of yellow ray and disc florets. N.W.T., Tuktoyaktuk. Plants growing on sandy beach, near coast guard base. 21 July, 1981. J.M. Gillett 18743. CAN. • Surface view of flower. Flowering head with yellow ray petals and yellow disc flowers that are beginning to open and show five petals. Nunavut, Axel Heiberg Island, Geodetic Hills. July, 1992. Photograph by S. Cumbaa. No voucher. • Close-up of bud. 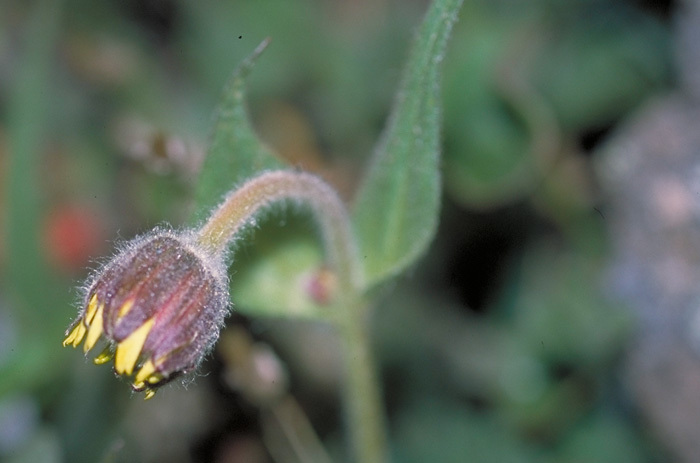 Note dark reddish and hairy involucral bracts, and yellow ray floret petals. Nunavut, Baffin Island, Iqaluit. 4 July, 2002. Aiken and Mallory 02–015. CAN. • Close-up of two young buds. Flowering stem with two flowering heads in bud that are borne on opposite sides of the stem. Single flowerings heads are more common. Nunavut, Baffin Island, Iqaluit. 4 July, 2002. Aiken and Mallory 02–015. CAN. • Inflorescences in seed. 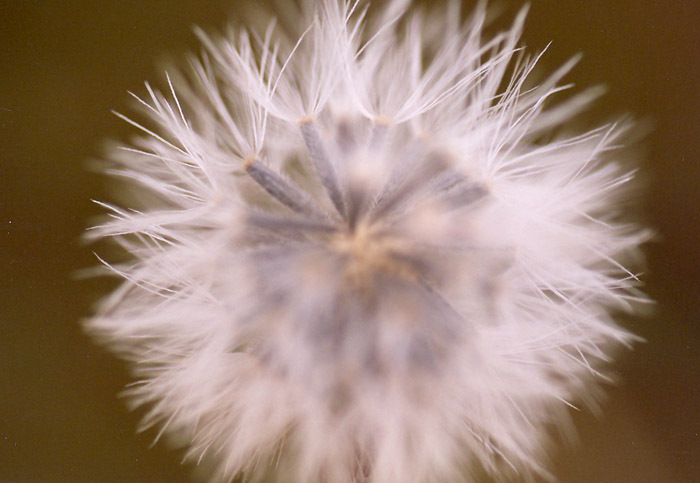 Inflorescenses with fluffy seeds. Nunavut, Baffin Island, Iqaluit, garden of NRI. 20 August, 2006. Aiken. No voucher. • Close-up of cypselas. 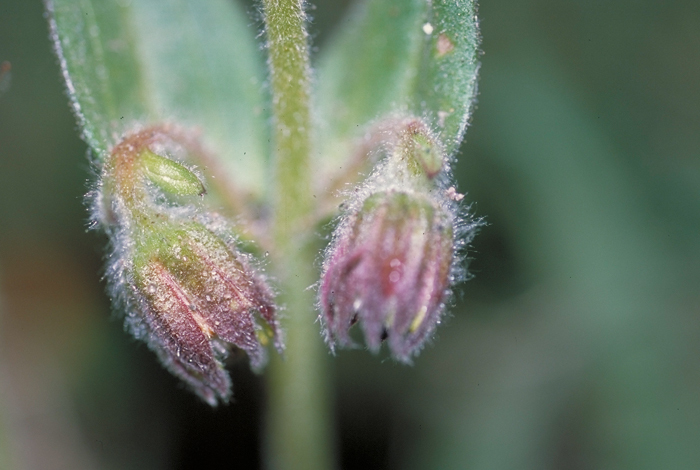 Blackish cypselas with hairs on the surface and a single row of pappus hairs. Nunavut, Baffin Island, Iqaluit, garden of NRI. 20 August, 2006. Aiken. No voucher. • Close-up of plant. Drawing by Mrs. S. Bergh and Mrs. L. Barstad based on a collection from Svalbard, Nordenskiöld Land, Colbay. 9 August, 1908. H. Resvoll-Dieset (as A. alpina, det. 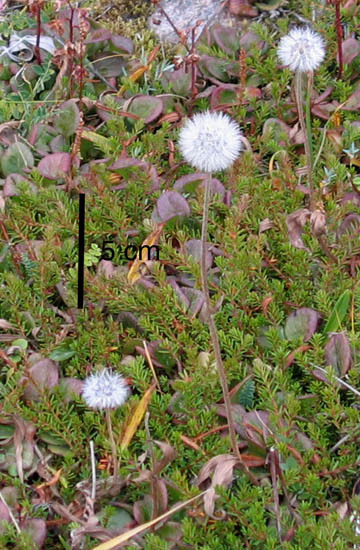 A. angustifolia E. Hadac, det. A. angustifolia subsp. angustifolia S. R. Downie. September, 1986). O 200347. With permission of the Botanical Museum University of Oslo, Norway. • Arctic Island Distribution.